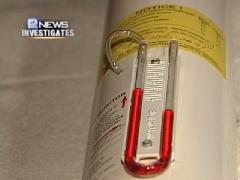 MILWAUKEE — Radon gas is a deadly hazard found in thousands of homes across the area. You may have heard about the risks and warnings of radon, but chances are, you’ve never seen the impact that radon can have and the danger it can pose to your family. “The doctor came and put his hand on my shoulder and said, I have cancer,” cancer patient Liz Hoffman said. “I’ve never smoked. (I was) not around second-hand smoke. (There’s no) no reason for me to have lung cancer except for living in our home breathing radon,” Hoffman said. Hoffman had lived in her Milwaukee home for 15 years, and knew nothing about radon or how dangerous it could be. “I asked my doctor if there is anything in my life that could have caused this and he said, no, nothing except for the elevated levels of radon in our home,” Hoffman said.